$1.90: Price of gas in Cherry Hill as of last month. 200: Years the First United Methodist Church in Moorestown has been in existence. 1,000: Acres of land in the Pine Barrens affected by a recent fire which broke out in Woodland Township. $1,400,000: Amount in reserve funds the Haddonfield School District will have to spend to address structural issues at Tatem Elementary and the high school’s main gym and cafeteria. More funds are needed to fix the problems at the high school, to be potentially paid for with a bond referendum, school officials say. 300-400: Pounds of cannon fragment found buried in the Revolutionary-era Fort Mercer, now Red Bank Battlefield Park. $4.6 million: Cost of the recently opened practice fields at Rowan University. The 17.5-acre complex is located on Route 322 near Route 55 and features two fields made of synthetic turf. SIX: Number of the nation’s most dangerous cities located in New Jersey, according to new information from website Neighborhood Watch. Camden is listed as the most dangerous, with Atlantic City and Bridgeton also making the list. 2.3%: Increase of tuition and fees for Rutgers University undergraduate students for the 2015-2016 academic year, an increase of about $318. $80,048.43: Amount Walmart and the Walmart Foundation have donated to the Food Bank of South Jersey, a combination of a grant from the Walmart Foundation’s State Giving Program and money raised through Walmart’s “Fight Hunger. Spark Change.” campaign. 65: Residents who used the “Evesham Saving Lives” designated driver service the first weekend it was up and running. The free shuttle, which caters to drinkers at local bars and restaurants, runs on weekend nights and brings their cars home, as well. A South Jersey resident rescued their neighbor’s dog after a house fire broke out at the Sicklerville residence while the home was unoccupied. The dog was treated at a local vet. Atlantic, Cape May and Ocean county businesses reported the best summer for business since Hurricane Sandy, with 5 to 10 percent increases in sales since last year. Cinnaminson will now ban smoking in public spaces like parks and other municipal-owned areas. Evesham may soon have its own dog park, on a two-acre parcel behind the municipal building. New Jersey was listed as the third highest state with Ashley Madison accounts, according to a collection of the hacked data. Several South Jersey towns, including Cherry Hill, Mount Laurel and Marlton, were listed among the communities with the most accounts. A Burlington County man posed as an attorney for 12 years, defrauding more than 74 people from several states and countries, most with matters in immigration court. A young Pitman woman who started the nonprofit organization Angels of God Clothing Closet—which provides clothing to South Jerseyans in need—had her car burglarized and all of her possessions stolen. She had her car packed in order to drive cross-country to college. Evesham police arrested a man after he was caught following a UPS truck and stealing delivered credit cards. Five South Jersey residents—including two suspects from Cherry Hill—were charged with first-degree conspiracy and first-degree distribution of cocaine, among other charges, for their involvement in a narcotics trafficking ring that used the U.S. Mail and other delivery services to ship cocaine from California to New Jersey. Gloucester County police are looking for a man they believe is a serial bank robber, hitting four local banks, the latest being Susquehanna Bank in Harrison Township. Jenny and Brian Beadling adopted Lager, a German Shorthaired Pointer in August and he soon began competing in the family hobby of dock diving, a canine aquatics competition for dogs and their handlers. The Beadlings spoke with South Jersey Magazine about the adoption process, how Lager was fitting in with his new ‘pack’ and how he’s excelling in his new hobby of dock diving. Tell me a bit about Lager’s background as an explosives detection canine. Lager was trained as an Explosives Detection Canine to protecting human life and assets on government contracts. He is highly motivated and can detect over 30 know chemicals used in explosives. He is trained to sit and will not move until released once he picks up a scent. We joke that if he ever sits next to a car we know to grab him and run! How did you hear about Lager? When Lager was set to retire, they knew from his training that he was obsessed with water and would jump in whenever permitted to. One of the trainers had seen a Dock Dogs demonstration in Reston, Va. and immediately thought that someone that competed in Dock Dogs would be a great home for Lager to spend his time swimming and playing. ...The potential adopter had to have access to water at home, know the German Shorthaired Pointer (GSP) breed, and promise to let him compete in dock dogs. ...We loved his story and after a few phone calls with SOC we were in the truck a day later to meet him and introduce him to our two German Shorthaired Pointers, Limoncello (Cello for short) and Hooch. Why did you want to adopt him, and think he’d be a good fit for your family? The first motivation is we love the breed. …We volunteer for the GSP rescue of NJ, and in fact all of the dogs' dock diving cash prizes go to the rescue for support of the dogs in need. When we went to visit, we were most interested in how all the dogs would get along. We have room in our hearts and home, but wanted to make sure everyone was happy and safe. This was no problem at all with Lager, as everyone seemed to fit in together from the start. Tell me a bit about the adoption process. The adoption process was easier than you would think with a dog of his training and ability. We were taught what he could do and all the commands he was taught. Once both parties agreed that it was a good fit, the release was signed, and he was in the car with us on his way to his new home. Tell me about dock diving for dogs. Is this something your family has always been interested in? 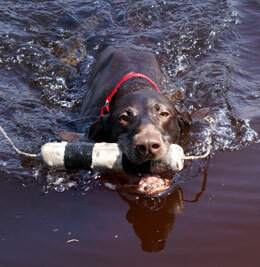 Dock diving is a canine aquatics competition for dogs and their handlers to compete in various disciplines. All require a level of trust and teamwork from both dog and handler, although most of the hard work is done by the dogs. There are three different types of disciplines within the sport. There is Big Air (the equivalent of the human long jump) where a dog will run down a 40 foot dock and see how far they can jump into the pool. Extreme Vertical (high jump) where the dog jumps up to grab a toy that is suspended eight feet out over the water at a height that starts at 4’6” and keeps moving up in 2’ increments until there is only one dog left, and Speed Retrieve (a sprint) is the third, when the dog races (swims) to grab a toy that is suspended at the end of the 40 foot pool. There is also Iron Dog, which is the “doggie triathlon,” where the combined points from all the three events are compiled for a total score. Why does it make sense for Lager to compete in dock diving? Lager has a very, very strong toy drive, along with an extreme love of water and swimming. Nothing makes this dog happier than fetching a toy, diving off the dock, swimming, or better yet, a combination of all three! What are your hopes for the rest of his life, as he’s done so much in his three years of life, and is now retired? We hope to provide Lager with the structure, exercise, and love he deserves after all that he has done for our country. We plan to continue dock diving with him, and to get him involved in canine nose work classes in the winter months. He also has started agility lessons, and has mastered the tunnel and jumps effortlessly! It is extremely close to the World Championships for DockDogs, (the organization we belong to,) but with what events we have left in the season, we hope to get him qualified for an invitation for the World Championships in Dubuque Iowa, this November, as both Cello and Hooch have already earned their invitation. Lager is an extremely happy, affectionate, and loving dog. He loves to be with his pack, both two-legged and four-legged. He is very smart, learns quickly, and is eager to please. He just competed in his second-ever dock diving competition, and jumped 21'3" in the Big Air competition. (This is extremely impressive—especially for a dog who has not officially been trained to do this!) He even earned himself a spot in the Finals at the event. Lager also won a 3rd Place ribbon in the Extreme Vertical competition, making his last grab at 6’4. Sherman, of Cherry Hill, was recently honored with the 2015 Staff Achievement Award by The Jewish Federation of Southern New Jersey. A member of the Jewish Federation since 1992, she’s played various roles, from director of operations at the Jewish Federation to children’s program director and camp supervisor at the Katz Jewish Community Center. Braverman was recently named Burlington County Teacher of the Year, an honor bestowed upon just 21 educators in the state. An art teacher at Maple Shade High School, she has taught art studio, photography, sculpture and ceramics, digital photography, advanced drawing and painting and AP studio art throughout her seven-year career. Braverman has also written and published two educational coloring books. Fischer, a local DJ, was recently honored with two coveted awards: DJ of the Year for 2015 and the Best New Dance for 2015. The Voorhees resident, owner and CEO (Chief Entertainment Officer) of The Groove Lounge in Voorhees, competed against 12 others at the 2015 International DJ Expo held in A.C. She’s also the owner of Betsy Fischer, LLC, a mobile DJ entertainment company specializing in children’s events. The Westampton native was recognized by Free Country, a lifestyle apparel brand, as one of Free Country’s Everyday Heroes for his work in starting Athletes C.A.R.E. (Creating Abundant Relief Effort), which raises money to help those in need and also hosts free youth sports clinics. Golini teaches at an inner city middle school in Newark, and Athletes C.A.R.E. has 150 in its organization and is on six college campuses. Petkus, of Medford, was named one of 10 finalists for Realtor Magazine’s 2015 Good Neighbor Award, which recognizes realtors who make their communities a better place to live by improving the quality of life for neighbors, and going above and beyond for their hometowns. She’s also the cofounder and executive director of the Domestic Violence Advocacy Center. A Washington Township High School senior, Wenzel was recently named a 2016 National Merit Scholarship Program semifinalist and can now compete against 16,000 semifinalists for consideration as a finalist. The NMSP is an academic competition for scholarships and recognition, and the semifinalists pool nationwide represents less than one percent of high school seniors. 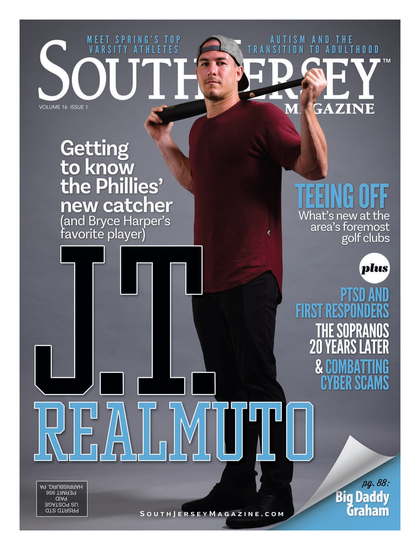 Published (and copyrighted) in South Jersey Magazine, Volume 12, Issue 7 (October, 2015).